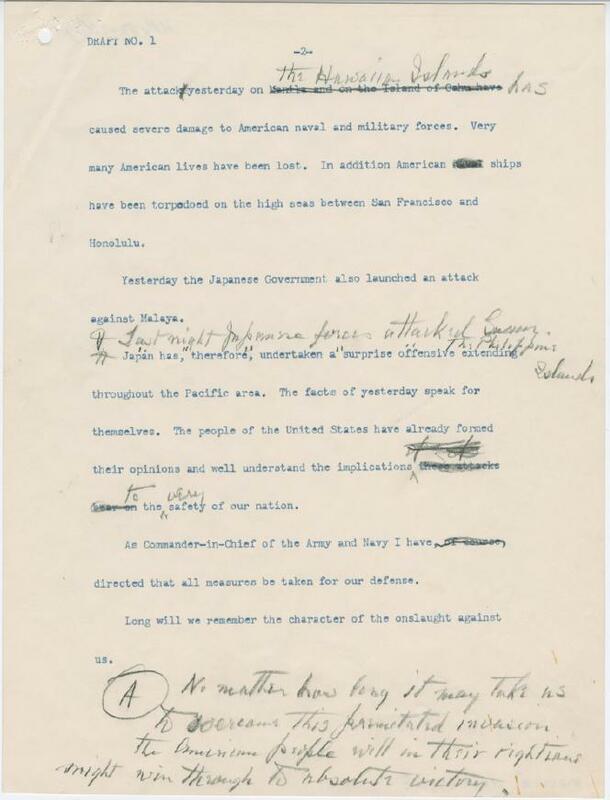 FDR's "Day of Infamy" Pearl Harbor speech, in first draft form. Photo illustration by Slate. Photos by The National Archives. 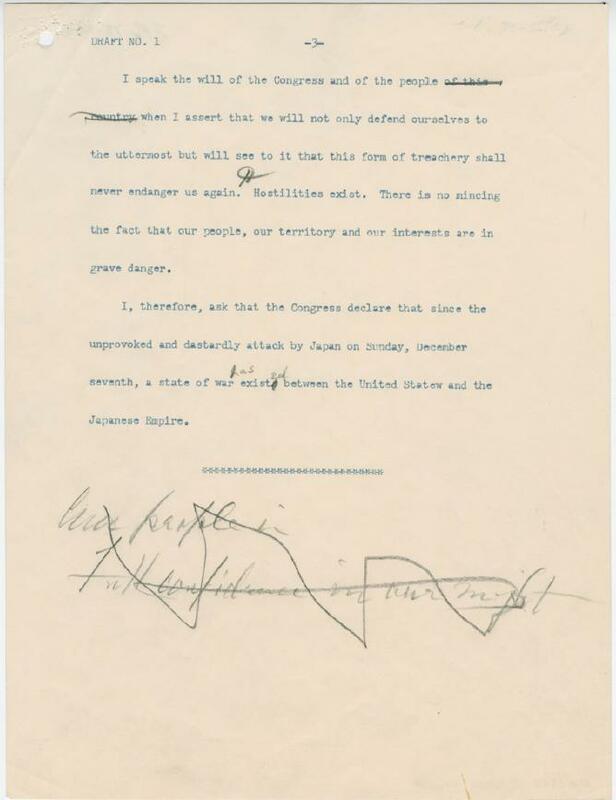 Following the Japanese attack on Pearl Harbor, Franklin Roosevelt drafted his Dec. 8, 1941 speech to Congress without the aid of his speechwriters, dictating to secretary Grace Tully. This draft shows the quick annotations and edits that the President made on a first pass; an article in the National Archives’ magazine Prologue contains pages from later drafts, as well as the final version. Instead, as Rosenberg argues, FDR stressed a simple, powerful narrative, tapping into past American legends. He juxtaposed the “treachery” and deception of the attack with the “righteous might” of the people who would respond, keeping the message short and simple, and asking for immediate action. The President also edited the speech so that the assault on America was front and center, striking mention of the concurrent attack on the Philippines from the first page and, in a later draft, identifying Oahu as an “American island,” for any listeners who might not be familiar with the relationship between Hawaii (which was not yet a state) and the United States. Roosevelt delivered the speech to a joint session (and to radio listeners) at 12:30 p.m. on Dec. 8. Congress voted to declare war against Japan by the end of the day. Thanks to historian Mary Dudziak for her help. Franklin D. Roosevelt Presidential Library and Museum.